It is true that I am a recent convert to the world of digital storytelling (DS), but now converted, I can’t envision teaching a class without including at least one digital story—heartily agreeing with Ohler (2007): “I have one word for anyone who wants to tell a story, and that word is ‘welcome’” (p. ix). A digital story is a 2- to 5-minute movie-like digital production that learners create using one of several readily available software programs. The story may recount an experience that a learner had, but it could also be the telling of an imaginary story or a story told through the eyes of another character. Learners write a story, turn it into a shorter script, and then record it in their own voice. They can illustrate the story with digital images (e.g., photographs) and enhance it with music that they have picked out. The creator can add text onto the images, and the images can be manipulated to appear as if there is movement, much like a movie. 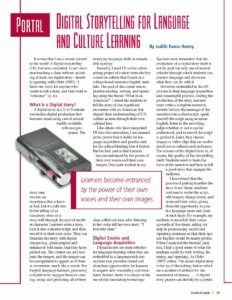 For English language learners, producing a digital story engages them in creating, using, and perfecting all of their emerging language skills in remarkable synergy. Recently, I used DS as the culminating project of a short-term elective course on culture that I teach in a college-based intensive English institute. The goal of the course was to practice reading, writing, and speaking using the theme “What Is an American?” I asked the students to tell the story of one significant encounter with an American that shaped their understanding of U.S. culture as seen through their own cultural lens. Technology in the English Language Learner Classroom? Teachers must remember that the production of a digital story itself is not the goal but only one of several vehicles through which students can practice language and showcase what they can do with it. However, embedded in the DS process is deep language acquisition and meaningful practice. During the production of the story, learners must write a complete narrative, rewrite/reform the message of the narrative into a short script, speak (record) the script using accurate English, listen to the recording, judge whether or not it can be understood, and re-record the script to perfect it. Later, they choose images or video clips that are under- stood across cultures and audiences. The essence of the digital story is, of course, the quality of the storytelling itself. Students need to learn the form of the narrative and how to tell a good story that engages the audience. I have found that the process of putting together the story is not linear; students continue to revise the script, edit images, change music, and re-record their voice, giving them the opportunity to practice language more and more at each stage. For example, my students re-recorded their voices upwards of five times, asking my help in pronouncing words and repeating sentences so that their spoken English would be nearly perfect. When I analyzed the finished projects, I had a good sense of what the students could do with writing, listening, and speaking. As Ohler (2007) writes, “the actual digital story is the tip of the iceberg, below which are a number of artifacts for the assessment of literacy….A digital story project can literally be a portfolio unto itself of great depth and breadth” (pp. 11–12). What is the technology for DS? Although more sophisticated pro- grams are available for purchase, many of the teachers I know have come to the conclusion that simple and free is better than costly and complex, especially when working with English language learners or elementary students. Movie Maker is included with Windows, and iMovie is included on Mac systems. Another program, Photo Story 3, is available as a free download from Microsoft, so I simply asked the tech specialist at my school to download it onto all the computers in the lab where we would create our stories. This is arguably the simplest program of the bunch. The digital stories that you create can appear very professional when finished. Within Photo Story, you can download images, manipulate movement within the image, and change the appearance of the images using, for example, sepia and watercolor effects. You can add titles or captions to the pictures, and you can type in script prompts that you will later turn into your voiceover as you record the narrative. For slide-to-slide transitions, you have a small library of graphic effects. Finally, the program also allows you to either create a digitized music composition to accompany your voiced script or add your favorite music from CDs or freeplaymusic.com to enhance the overall glitz. My learners were able to master most of the elements of Photo Story after about an hour of practice. The finished stories can be downloaded to a disk or sent via e-mail to friends and family, but one of the established tenets of the DS process is the public presentation of the stories. These works of art are created to be showcased and celebrated. In my culture class, I experimented with digital stories as a way for students to explore their own feelings toward U.S. culture through the retelling of a critical incident. Critical incidents are personal events that hold significance for the individual; these events do not need to be momentous, but can tell the story of a small, everyday interaction that is remembered as significant or leads to questioning of culture. Whether learners intend to be lifelong residents or soon return to their home countries, all will face some degree of acculturation stress as they experience cultural incidents that they may not fully understand. Taking the time to reexamine the event leads to critical learning about culture. But, of course, the goals of this project went beyond acculturation; I hoped that a large amount of language learning and practice would occur during the DS production. We began the first session by learning the language of technology. I gave students handouts listing vocabulary terms and imperative sentences that they would need to understand as I coached them through the DS process. We worked to translate and explain terms such as to download, to google, to edit, to import images, and so on. I made a pod- cast in which I repeated each of the terms several times and explained their use. It was important for the learners to have frequent and repeated access to the terms in aural form so that they could develop a comfort level with pronouncing the terms and using them in classroom discussions. Our first digital story production involved writing an “I Am” poem and producing that poem in a digital format. This is how YuLing (Lucy) began her story: “I am Lucy. Lovable. Kind. Open minded. I love nature. I hate complaining.” The restricted writing of the poem allowed the students to focus on the technology and learn how to insert their own photographs into the program. Plus, as they began to define who they were in the digital story, they had a jumping-off place to define others (in this case, Americans). We also read stories about cultural misunderstandings and discussed cultural differences. For example, we read and dis- cussed “Conversational Ballgames” (Masterson Sakamoto, 2007) a short essay about the conversational missteps of an American in Japan. The students also read my journal accounts of cultural misunderstandings that I experienced when I taught in China. The students’ initial “What Is an American?” project assignment was to think of an event that happened during their stay in the United States—a critical incident that was puzzling or troubling— and to write about it in journal form. After they wrote, we conducted a story circle, sitting around listening to one another’s tales and providing feedback about what we felt was the essence of the story. Sunwha, for example, told her story of how troubled she was that her landlady had brought her son and his family up into Sunwha’s apartment unannounced one evening and that they did not remove their shoes as they walked through the rooms. She told of staying up very late to rewash all the floors so that they would be spotless when her family awoke. One tradition of the Korean culture is for people to take off shoes when they go into their houses. I moved to America. People do not take off shoes. One day, my landlady and her family came up to my room. They didn’t take off shoes. What a day! What a dirty shoes on my floor! I can’t imagine that there are dirty germs on my room. After they were gone, I cleaned up my floor, scrubbing, brushing. Finally, I’m done with my work and I enjoy it. Look at my shiny floor. Ohler, J. (2007). Digital storytelling in the classroom: New media pathways to literacy, learning, and creativity. Thousand Oaks, CA: Corwin Press. Porter, B. (2004). DigiTales: The art of telling digital stories. Sedalia, CO: Author. Masterson Sakamoto, N. (2007). Conversational ballgames. In J. A. Reinking and R. von der Osten (Eds. ), Strategies for successful writing: A rhetoric, research guide, reader, and handbook (8th ed. ; pp. 505–508). Upper Saddle River, NJ: Prentice Hall. Copyright © 2008 Teachers of English to Speakers of Other Languages, Inc. Reprinted with permission.